In an exceptional opportunity for emerging Australian screenwriters, applications are open for an innovative residential Script Lab workshop with Bryan Elsley, internationally acclaimed creator and co-writer of the UK teen series Skins, to develop the ground-breaking on-line drama series Deadlock. A total of 6 writers aged 18 to 35 years will be selected to travel to Bryon Bay to participate from December 14 – 18. 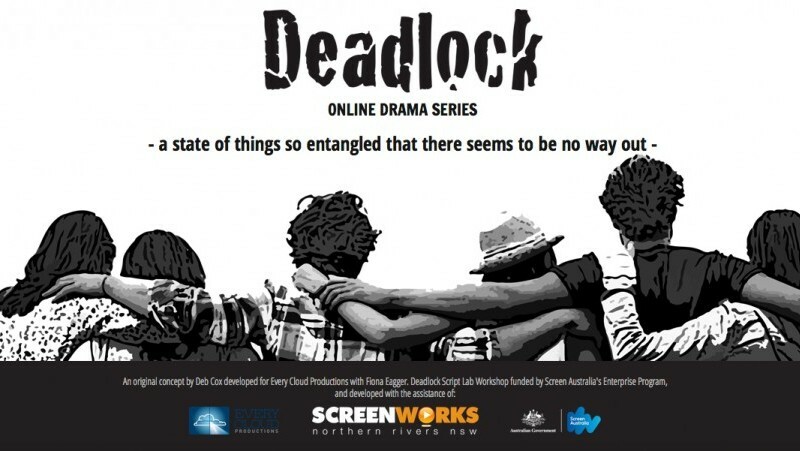 Developed and funded with the support of the Screen Australia Enterprise Stories Program, Every Cloud Productions will deliver the workshop in partnership with Northern Rivers Screenworks as part of the ongoing development process for their drama Deadlock. The workshop will use an innovative story development approach to mentor emerging screenwriters and explore the best ways to reach the target audience. Based in the UK, Bryan Elsley will travel to Australia to join forces with Every Cloud Productions’ Executive Producers, Deb Cox and Fiona Eagger, along with multi-platform writer Mike Jones and local Indigenous writer Jon Bell. Together this team of internationally acclaimed industry professionals will guide young writers through the intensive Script Lab. To ensure authenticity of story, the workshop will be supported by young people from the Northern Rivers aged 16 to 18 years, who will help inform content and relevant delivery platforms. “By bringing together a collaborative team of emerging screenwriters, local youth and experienced storytellers, we hope to craft a series that engages a wide audience, and offers content current and honest enough to provide genuine insights into the ‘secret’ life of youth,” explained Every Cloud Productions’, Fiona Eagger. Applications are open for emerging writers to participate in this workshop. Deadline for application is 11.59pm (AEDST), 2nd November 2015. For more information on the role of the emerging writers and how to apply visit www.deadlock.tv. Successful applicants will be notified by November 12. Every Cloud Productions is an independent, Australian production company producing distinctive, high-quality television drama for domestic and international markets. Founded in 2009 by leading television industry creatives, Fiona Eagger and Deb Cox, the company balances strong storytelling and high production values with astute producing expertise. Independently, Fiona and Deb have produced and created close to 100 hours of prime time drama, including seminal drama series SeaChange, telemovie The Society Murders, family drama East of Everything, acclaimed Indigenous drama The Gods of Wheat Street and hit series Miss Fisher’s Murder Mysteries. Every Cloud Productions is focused on fostering Australian talent, supporting co-operative alliances with creative producers across various media formats, and engaging with development opportunities within the industry. Possessing established relationships with international sales agents and distributors, the company continues to focus on making exceptional drama productions for domestic and international audiences. Northern Rivers Screenworks is the regional film, television and digital media office supporting the local screen industry, its practitioners and promoting screen culture. We are a home-grown not-for-profit, membership based association managed by a board of 8 directors that voluntarily provide industry, management and screen industry knowledge and experience. We are small – with only two part-time staff (our General Manager and Events & Membership Manager) – but we continue to punch above our weight (for over a decade now!). We service a large region that covers an area of 20,895 km² and includes seven local government areas – Ballina, Byron, Clarence Valley, Kyogle, Lismore, Richmond Valley and Tweed. Bryan Elsley is a television writer who co-created the highly successful teen drama SKINS with his son Jamie Brittain and more recently created DATES, through his company Balloon Entertainment, which aired on Channel 4 in summer 2013. His other writing credits include 40, NATURE BOY and award winning THE CROW ROAD. Balloon Entertainment was established in 2012 by Bryan and comedian Harry Enfield. The company puts a focus on nurturing emerging talent in drama and comedy. DATES, an actor led drama focusing on two people during a first date was the first production by Balloon Entertainment. They are now in development on an American version of the series with CW. In 2014 Balloon produced Harry and Paul’s Story of the Twos for the 50th anniversary of BBC2. Mike Jones is a writer of screen page and digital interactive media, a well regarded expert in multi-platform storytelling and recipient of numerous accolades, including an Australian Writers Guild award. Most recently Mike worked with screenwriter Vicki Madden on her 8-part mystery series, ‘The Kettering Incident’ for Foxtel and together they are co-writing a new crime drama series with support form Screen Tasmania. As a novelist Mike’s latest work includes the three-book series of supernatural gothic novels, The Transgressions Cycle published by Simon&Schuster in 2015. Mike pioneered web-series in Australia serving as EP & script-editor on cult post-apocalyptic series, ‘Wastelander Panda’ for ABCTV and has worked in project development for production companies including Warner Bros, Fox, Cornerstone & multiplatform studio The Project Factory. Mike is head of story development for interactive media company Portal Entertainment UK where he was lead-writer on their immersive iPad thriller ‘The Craftsman’, and collaborated on other Portal projects including interactive games for Disney/Pixar’s ‘Inside Out’ and dark genre content discovery system ‘Thrill Me’ which lead to Portal receiving the UK Digital Innovation prize for Film & TV 2012. Mike’s early career spanned writing for theatre, including the award-winning stage play ‘The Candle’. He lectures in story & writing at the Australian Film TV & Radio School & has coordinated multi-platform development programs worldwide including the Immersive Writing Lab UK & PlatformX for the Australian Writers Guild.